There is a centuries-old children's rhyme remembered in the UK; this familiar nursery rhyme, "Hot cross buns," originates from the call of the street vendors who sold them in Elizabethan times. [1533-1603]As Easter marks the end of the Lenten fast, food is an important part of this festival. Wheat is another symbol of life and on Good Friday many people in Europe and North America eat hot cross buns. If you have no daughters, give them to your sons. One a penny, two a penny, hot cross buns. If you haven't got a ha'penny, Well God bless you. Dating back to medieval times, the buns were traditionally eaten on Good Friday, but they are now popular all around the Easter season. These sweet treats, fragrant with fruit and spices, are marked with a cross, either slashed into the dough before baking, or drizzled on in icing afterwards. 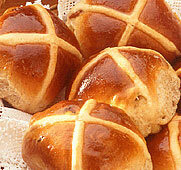 The history of hot cross buns dates far back to the pre-Christian era. It is thought that they are descendants of the small cakes offered to Eostre, the goddess of spring. They may have been marked with a cross even in ancient times, to represent the four quarters of the moon. In later centuries the church, unable to stamp out ancient pagan traditions, decided instead to "Christianize" the buns by associating the cross with that of Jesus. The German Easter loaf is Osterstollen and in the Netherlands people eat a sweet bread filled with raisins and currants called paasbrod. Easter Bunny and Tooth Fairy End of Innocence! Easter Bunnies - Good Advice! Got to Find Them Quickly!